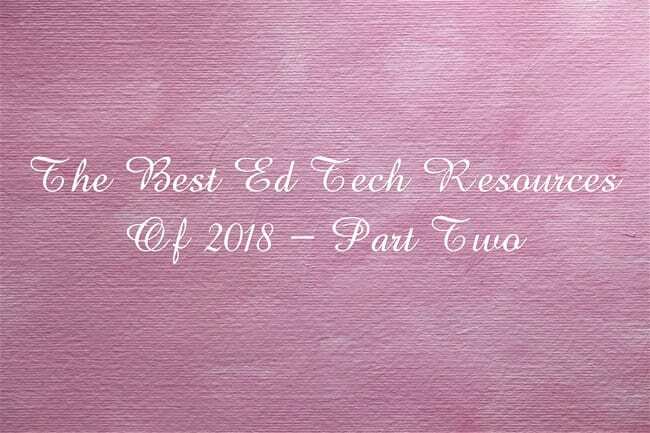 I publish a regular series called Ed Tech Digest, and I thought it would useful to readers and to me to review them and highlight the ones I think are the best of the year. I’m adding this post to ALL MY END-OF-YEAR “BEST” LISTS FOR 2018 IN ONE PLACE! You can see previous editions of this list, along with all the “Best” lists related to ed tech, here. The Digital Gap Between Rich and Poor Kids Is Not What We Expected is from The NY Times. Natomas Unified School District and Comcast to provide free Wi-Fi to low-income families is from The Sacramento Bee. I’m adding it to The Best Resources For Learning About Schools Providing Home Computers & Internet Access To Students. Tools that aim to reach all types of learners, wherever they are is a post from Google listing all their accessibility tools. Speaking of Google, here’s a critical article from The New York Times: Google Is Teaching Children How to Act Online. Is It the Best Role Model? The Ultimate Guide to Twitter is from The Edublogger. I’m adding it to a very outdated “Best” list – The Best Resources For Beginning To Learn What Twitter Is All About. SO YOU WANT TO START A TEACHER BLOG? is from The Edublogger. I’m adding it to The Best Sources Of Advice For Teachers (And Others!) On How To Be Better Bloggers. How Game Apps That Captivate Kids Have Been Collecting Their Data is from The NY Times. Tech or no tech, effective learning is all about teaching is from Brookings. I’m adding it to The Best Research Available On The Use Of Technology In Schools. Headliner creates automatic subtitles for videos – for free! Insights from 200+ years of personalized learning is from Nature. I’m adding it to the same list. Rethinking Technology in Education is by Robert Slavin. I’m adding it to The Best Research Available On The Use Of Technology In Schools. Three lessons from rigorous research on education technology is from The Hechinger Report. I’m adding it to the same list. SHOULD YOU USE STUDENT PHOTOS ONLINE? is from The Edublogger. I’m adding it to The Best Teacher Resources For Online Student Safety & Legal Issues. Is Comprehension Better with Digital Text? is by Timothy Shanahan. I’m adding it to The Best Resources On Which Is Best – Reading Digitally Or Reading Paper? Digital Text is Changing How Kids Read—Just Not in the Way That You Think is from MindShift. I’m adding it to The Best Resources On Which Is Best – Reading Digitally Or Reading Paper? Skim reading is the new normal. The effect on society is profound appeared in The Guardian. I’m adding it to the same list. A Google Classroom Cheat Sheet is from Tech Tips 411. I’m adding it to A Beginning List Of The Best Resources For Learning About Google Classroom. HOW THE STARTUP MENTALITY FAILED KIDS IN SAN FRANCISCO is from Wired. I’m adding it to The Best Posts & Articles Highlighting Why We Need To Be Very Careful Around Ed Tech. The 3 Questions Researchers Want Educators to Ask About Ed-Tech is from Ed Week. I’m adding it to The Best Advice On Using Education Technology. A Short Guide to Getting Started With Google Drive is from Richard Byrne. I’m adding it to The Best Resources For Learning How To Use Google Docs/Google Drive. Learning the Wrong Lessons from Video Games is by Dan Meyer. It’s very interesting, though I’m having a hard time wrapping my head around what it means practically. He says he’ll give more examples soon. NextVideo: “The US Midterms Explained” – By Australians!